Check back with these decrees daily through the Decrees in the app. Use the Calendar in the app to schedule your watch each month. Use the form below to report anything you see and hear in prayer. 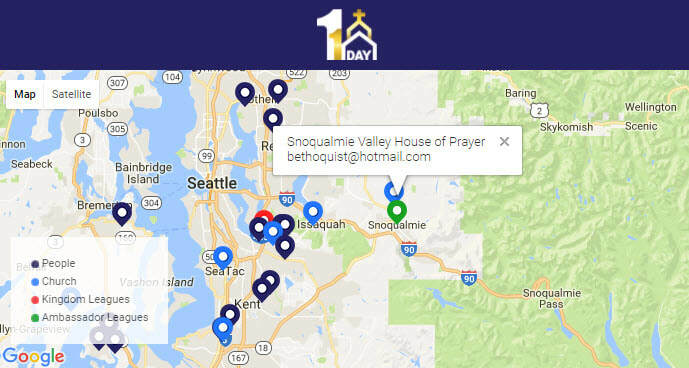 To learn how to use the app & the 1Church1Day system visit the Training section of the app or our website. Note that you must be a registered user with 1Church1Day to access training by clicking here. 1 Timothy 4:1 - praying for courageous ministers that would speak truth and confront false doctrine and teachers in the Church. Unity of mission among the pastors and churches of the Snoqualmie Valley that we are about Kingdom building. Malachi 4:6 - pray for strong families and that God would turn the hearts of the father to the children and the children to the fathers. Proverbs 2:3-6 - the fear of the Lord is the key to wisdom, knowledge and understanding. Psalm 139:14-17 - we pray that God would send Christians to serve as doctors, nurses, administrators, lab technicians.... into our healthcare system. John 4:23 - pray for the liberty to worship God in spirit and in truth. Pray for Christian business people to prosper so they can create more jobs with fair pay for their workers. Psalm 139:14-17 - we pray that God would send Christians to serve in every area of media, news, arts and entertainment and that they would become the most creative and influential people in that business for our Lord Jesus Christ.